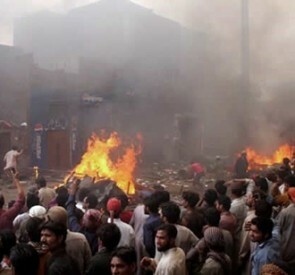 A mob of Muslims, apparently angered by Christian youths playing music on their phones from the back of a rickshaw taxi, responded by attacking residents of the mostly Christian Francis Colony section of Gujranwala, near Pakistan’s city of Lahore. The incident started after the prayer leader of the Lahore suburb’s largest mosque accused the teenagers of playing their music too loudly. A scuffle resulted, but the argument quickly erupted into an armed attack by a Muslim mob on the Christian homes in the Francis Colony. Pakistan’s Express-Tribune reported that the argument was between two groups of Christians. However, a Gujranwala area pastor who asked not to be named for security reasons says that Christian young people playing music on their cell phones was the catalyst for the melee. “According to initial information, a group of Christian boys was snubbed by a local cleric for playing music on their cell phones while passing by a mosque,” the pastor said. An eyewitness who also asked not to be named says the young men were simply enjoying the evening. “Our boys were passing the mosque when the prayer leader objected to their playing music on cell phones,” the eyewitness said. The pastor adds that the young men complied with the demand. “The young men turned off the music at that moment but switched it on again after covering some distance. The cleric raised a clamor and accused the boys of showing disrespect to Islam,” the pastor said. The pastor adds that members of the Christian community were quick to report their concerns to the police. “The police told us not to worry and assured us that they would contain the situation but no measures were taken,” the pastor said. The pastor says the Muslim mob was well armed. “A large crowd, armed with sticks and weapons, attacked cars and shops in the Francis colony on Wednesday,” the pastor said. The pastor says a neighboring church was also a target. The pastor adds that the Muslim gang members came from several towns in the area and didn’t limit the violence to Christian homes. “Around 2 p.m., a Muslim mob attacked the neighborhood, ransacking shops, houses and around 5-7 vehicles parked on the road,” the pastor said. Again, local police did almost nothing to stop the violence. “We saw a police mobile unit from the area’s checkpost parked in the vicinity, but they did not intervene and let the mob damage our property,” the pastor said. The pastor also says that even when the police did arrive at the scene, they were slow to react. He adds that the Christians eventually acted in their own defense. The pastor also says that residents of Francis Colony believe that at one point, the police were actually helping the rioters. Several hours into the attack, a capital city police officer visited the area, but went to the church to lecture the Christians. “He went to the church where he addressed the Christian community and appealed to them to stop the protest,” the pastor said. International Christian Concern’s Middle East analyst Aidan Clay confirms that Muslim violence again broke out over a relatively insignificant incident. “Like the attack that occurred less than a month ago in the Joseph Colony of Lahore when some 180 Christian homes were torched on March 9, an enraged mob took out its vengeance on an entire Christian community all because of a petty quarrel between a few Christians and Muslims,” Clay said. Clay says that this attack proves the volatile nature of Islamic doctrine. “The incident once again proves that it is extremist ideology, not the government, which ultimately rules the streets of Pakistan,” Clay said. Clay also confirms that the police were again MIA from their duty. “Moreover, witnesses indicate that the police again stood by while the violence escalated. Only hours before the attack, the Supreme Court condemned police for not intervening in the March 9 riots,” Clay said. Clay adds that it’s getting to be normal for Pakistanis to ignore the edicts coming from the courts. “Yet, to no one’s surprise, the court’s rebuke fell on deaf ears. There is a widespread belief in Pakistan, including within the police department and the government, that Christians and other religious minorities, including Shia Muslims, are second-class citizens and should be treated as such,” Clay said. “Very little protection is offered if Muslims are the aggressors and Christians are the victims,” Clay said.